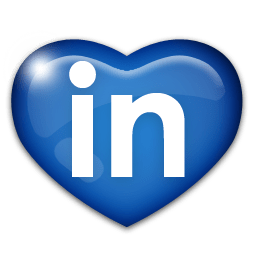 With LinkedIn having over 300 million members, it may pay to upgrade to the premium version in order to gain competitive advantage and further enhance your brand image. Check out the new features that were available the beginning of July to premium members. I’ve also included a step-by-step “How To” to help you change or add your background photo. Move your cursor over Profile at the top of your homepage, and select Edit Profile. Click Edit Background, which appears above the top section of your profile. Select a background image or click Upload to use a photo of your own. Click Edit Background To get started. 2. 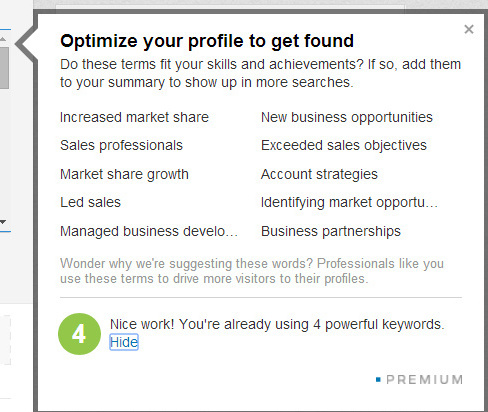 LinkedIn has added a top key word prompting feature for you to help with optimizing your profile. Premium members will be able to pick from a highly personalized set of keywords to add to various sections of your profile. When someone is searching for a particular skill like “Blogger” and you have it listed on your profile, it will look twice as big as other results, therefore, allowing your profile to stand out from the crowd and get you noticed. This feature is not available to free members. 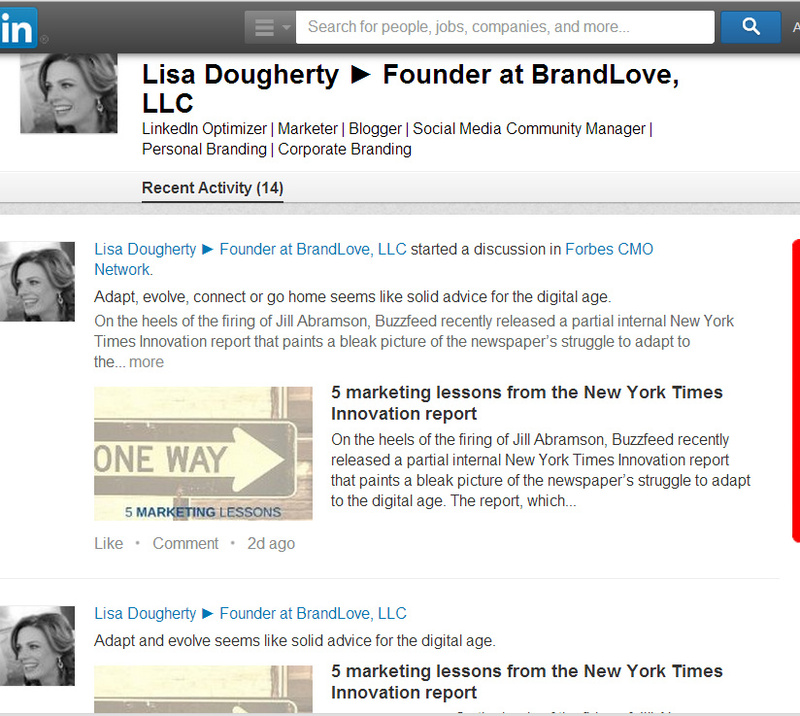 For other ways to optimize your profile, check out 14 Tips To Build Your Personal Brand on LinkedIn. 3. A new “open” setting that allows unlimited visibility. Only premium members will have the ability to choose this setting. This feature will allow your profile to be visible to everyone on LinkedIn (not just in your network) and will also allow them to reach out to you for free. Previously, premium members could opt-in to this feature, but now is standard. If you do not want this feature, you will have the ability to opt-out. 4. Tracking your ranking and visibility among your first-degree connections has been improved. Not only will you be able to see a full 90-day view of “Who’s Viewed Your Profile” but you will also be able to see your top 100 results for “How You Rank” sparking a friendly competition within your network. 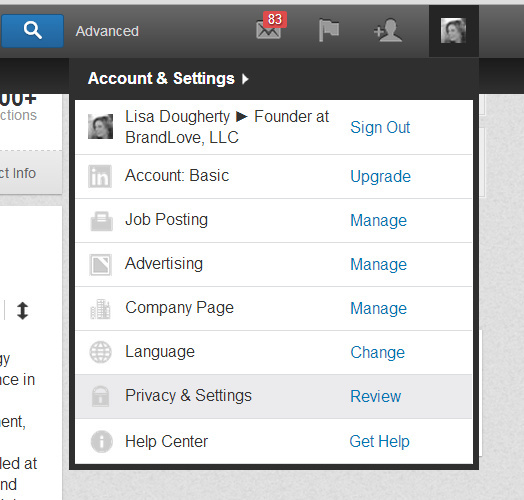 Also worth mentioning, LinkedIn is also introducing a new premium starter package called Premium Spotlight. According to LinkedIn, “this new subscription consists of all the features mentioned above and is designed for ambitious professionals who are looking to take their career to the next level. You can compare all the premium offerings here if you’re interested. I would imagine this is in an effort to increase its Premium Subscriptions revenue of $95.5 million which is an increase of 46% over Q1 2013 (and 20% of total revenue, a percentage that remains consistent for the first quarters of both 2013 and 2014) according to a Forbes article. Do you think it pays to be a premium member? Please leave your thoughts in the comments section. If you found this article helpful, be sure to follow @BrandLove on Twitter, “Like” BrandLove on Facebook, follow BrandLove on LinkedIn and add BrandLove to your Google+ circles. There are many more tips and tricks on my other social networking sites. Thank you for reading this post and feel free to share it with your friends. Your support is much appreciated! Move your cursor over the down arrow icon in the top section of a profile as shown in the screenshot below if you are on your own profile. If you are on someone else’s profile, click on the arrow next to your connection’s “Endorse” tab. Click “View recent activity” as shown in the screenshot above. If you choose not to have your activity broadcast to your network, you can turn off this feature in one of two ways. 1. In the top right corner, hover over your photo thumbnail for the drop down. Click on Privacy & Settings. 2. 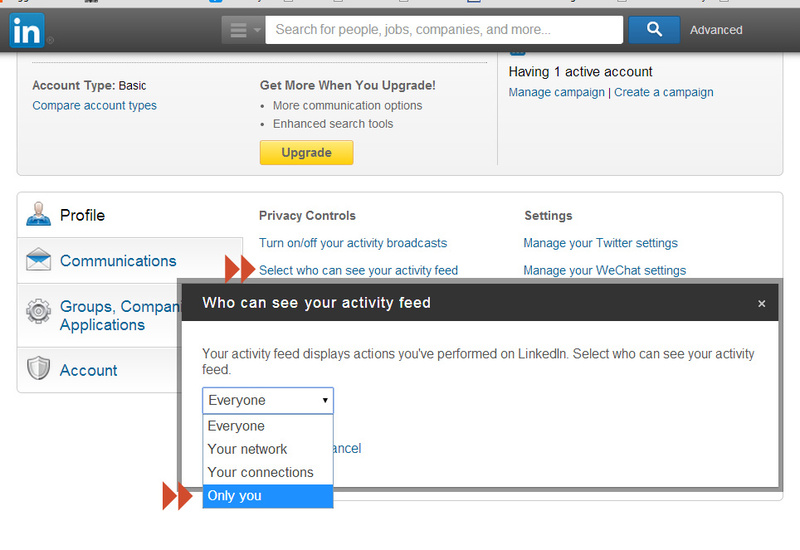 Uncheck the box in your activity broadcast setting under Privacy Controls shown below. 3. Also, click on Select Who Can See Your Activity Feed. Select”only you” as shown below. Turn off activity broadcasts while in edit mode. Connecting with other LinkedIn members. Note: You can turn the notification off when you make a new connection by hiding your connection list. Group activity – You have the option to turn this off within your Group settings, if you don’t, an activity will post. Learn more about preventing updates when you join a group. Sharing content such as website links, articles and ideas. Following an Influencer, Channel, or Publisher. When you “Like” shared content. If you found this article helpful, be sure to follow @BrandLoveLLC on Twitter, “Like” BrandLove on Facebook, follow BrandLove on LinkedIn and add BrandLove to your Google+ circles. There are many more tips and tricks on my other social networking sites. Thank you for reading this post and feel free to share it with your friends and colleagues. Your support is much appreciated! Linkedin is a great channel for personal branding and can help you build a powerful presence on the most popular professional social network for over 300 million professionals. LinkedIn can be extremely useful for job search, networking and also for lead generation—especially when you’re aware of all the hidden tricks. Here are fourteen tips and a cheat sheet for Linkedin character counts to help you optimize your Linkedin profile without having to call your techie friends. Before you get started, here is a cheat sheet of each area so you know up front how many characters or keystrokes each field allows. Letters, numbers, punctuation and spaces count towards character count. Professional Headline: 120 character limit. Website Anchor Text: 30 maximum characters. Website URL: 256 maximum characters. Phone number: 25 maximum characters. Only your 1st degree connections can see this information. IM (Instant message): 25 maximum characters. Only your 1st degree connections can see this information. Address: 1000 maximum characters. Only your 1st degree connections can see this information. Company Name: 100 maximum characters. Position Description: 200 minimum and 2000 maximum characters. 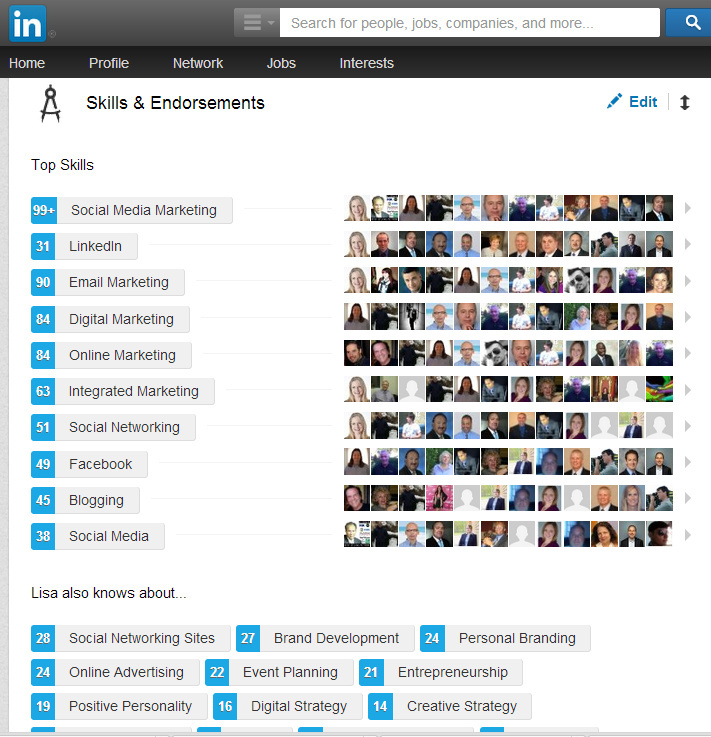 Skills and Endorsements: You may add up to 25 skills using 61 characters per skill. LinkedIn Status Bar Update: You can use up to 700 characters unless you want to update your Twitter status at the same time. Twitter updates are limited to 140 characters. If you go over the 140-character limit, only the first 140 characters will be visible on Twitter. A professional profile picture that represents your industry. 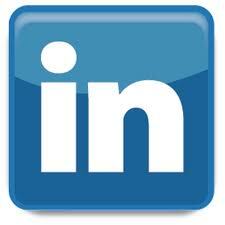 This is critical for your Linkedin success! For example, if you are a Creative Director, you might want to have more of an edgier photo as opposed to a CEO, who would want to have a suit on in a traditional pose. Having the same picture on multiple social media channels like Twitter, Facebook, LinkedIn and Google+ will help build your personal brand. Whatever you do, don’t use a selfie, your company logo, you and your furry friend or something like the below photo. These types of photo’s could damage your personal brand which defeats the whole purpose of being on Linkedin. A definite “No” for a LinkedIn profile photo. 2. Create Your Vanity URL. 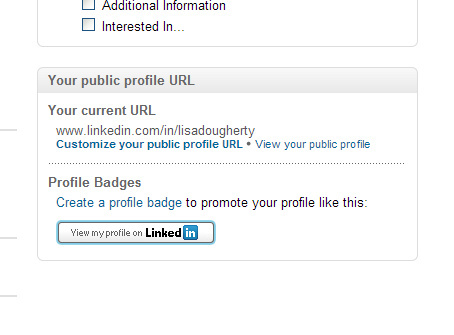 When you create your LinkedIn profile, the default URL that you get doesn’t exactly roll off the tongue. 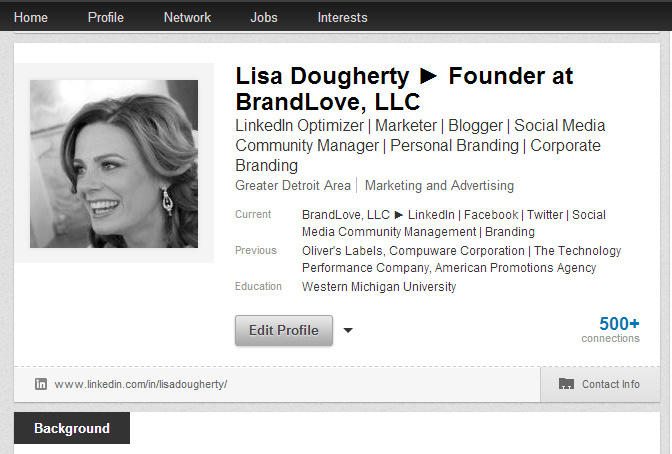 Instead of a URL with a million confusing numbers at the end, you need to create one like this: http://www.linkedin.com/in/lisadougherty. This URL is far more friendly from an SEO point of view and is a vital opportunity to have your profile rank higher in Google and to make it easier for people to find you. Go here and click “customize your public profile URL” on the right hand side. 3. Get Recommendations. It is important to have at least three recommendations from colleagues, management, people you manage, vendors or customers. Recommendations now appear right below your job description for a certain position. Linkedin no longer requires three recommendations anymore to have a complete (or “All-Star”) status but it is still considered a best practice. Recommendations are written for specific roles and show up underneath each position in which they are written. They are very different from Endorsements and serve a different purpose. 4. Get Endorsements. Endorsements are one-click acknowledgments from your network showing that you are being recognized for a certain skill. If you would like to learn more about Endorsements, check out this earlier blog post. 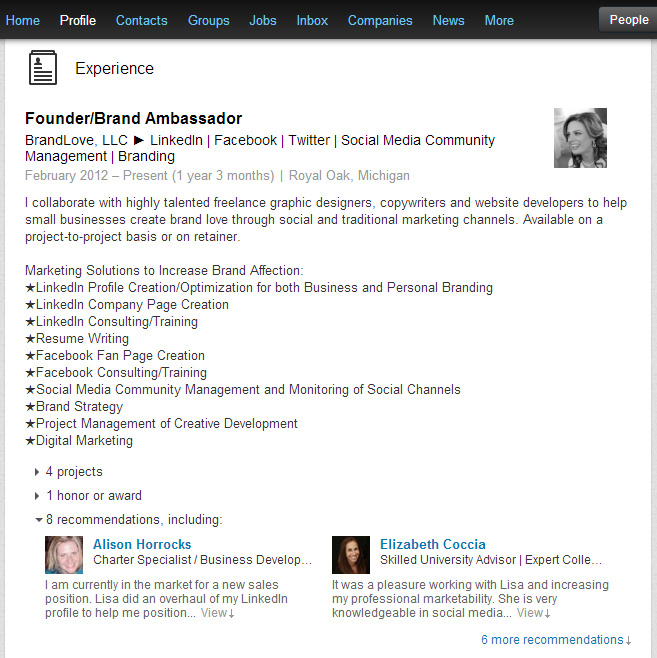 The reason endorsements are important to your profile is for search results. The more endorsements you have for a specific skill, the more likely that you’ll come up in the search results when someone is searching for that skill. For example: I have 99+ people who have endorsed me for Social Media Marketing. When a hiring manager or recruiter is searching for people with the skill ‘social media marketing’, it is more likely that I will come up somewhere on the first few pages of the search results. 5. Create “Sexier” Website/Blog Links. Don’t list the generic “website” but brand it with your company name or blog name to make those links more appealing to people who view your profile. For example, if you want to include a link to your blog, rather than choosing LinkedIn’s standard “Blog” anchor text, customize it to include keywords that indicate what your blog is about like, “Social Media Blog or BrandLove, LLC Blog.” This will help optimize your profile and drive Google PageRank to your other web properties. Each profile can display up to three website links like this, and they can be customized by editing your profile, clicking edit on your website links, and selecting “other” in the drop-down menu to customize the anchor text. 6. Rearrange Your Profile. 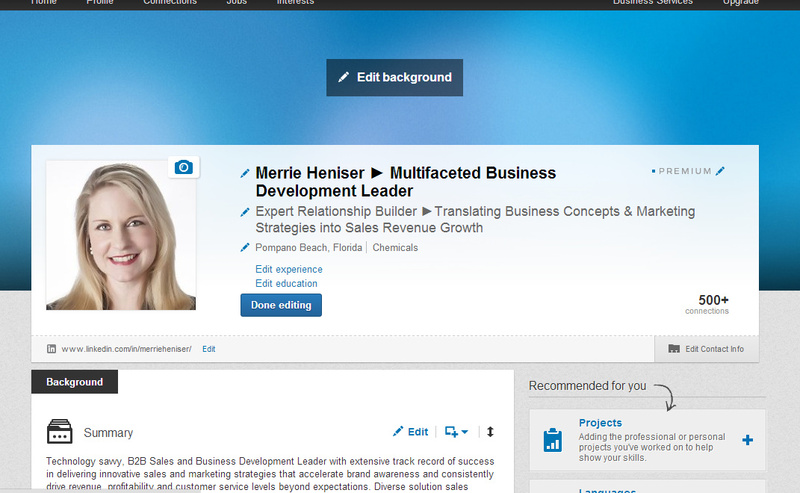 LinkedIn enables you to reorder the sections of their profile in any way you prefer. When in edit mode on your profile, hover your mouse over the title of each section. Your mouse will turn into a four-arrowed icon, at which point you can click then drag and drop to another position on your profile. 7. Search Engine Optimize Your Profile. You can also optimize your profile to get found by people searching LinkedIn for key terms with which you want to be associated. Add these keywords to various sections of your profile such as your summary, specialties, job title, career history and personal interests. 8. Use Keywords in Your Headline. 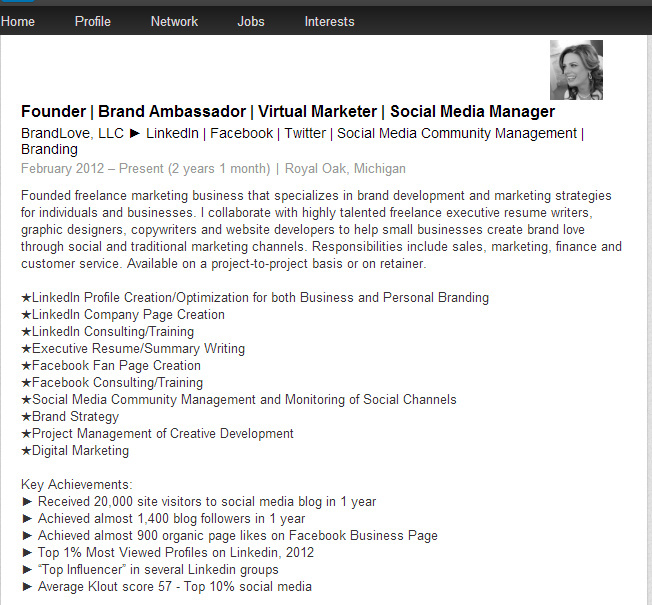 The headline (up to 120 characters) is the first thing people see when they go to your LinkedIn profile. Unless you change it, your headline will appear as your current or last position held. Since this headline will appear in various places on LinkedIn, you want it to be more descriptive. The Linkedin algorithm seems to put a lot of emphasis on the words used in the headline when ranking people, so make sure it includes your USP, benefits your company offers or your geographic location if you serve a specific area. 9. Add Projects. 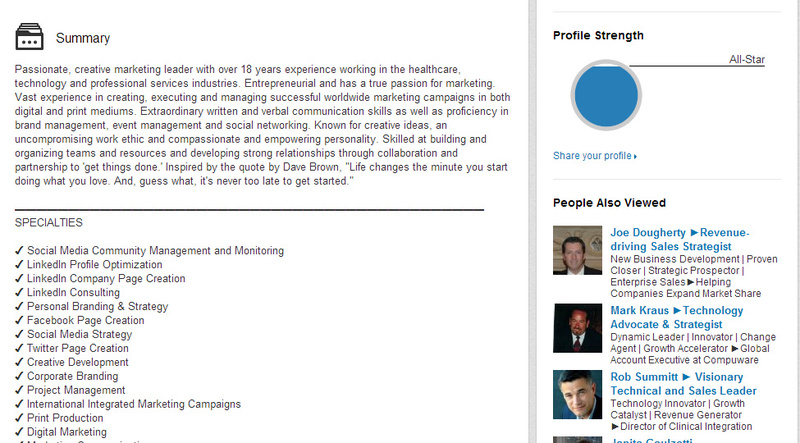 I highly recommend adding a projects section to your profile, especially if you are a Consultant or Freelancer. By adding this section, it will allow you to name your project and input a URL. This then turns the title of the project into a hyperlink, leading the viewer to the project’s website and thus creating an inbound link. You can specifically relate your project to a position that you hold or have held. This can be a great way to show off your expertise in a current or previous position by showing viewers evidence that you know your stuff. The best part is that you can add “Team Members.” If you are connected to your collaborators on Linkedin, you can add them here and their name will appear as a hyperlink to their LinkedIn profile. 10. Join Groups. If there are groups related to your industry or niche then make sure that you join them and, if at all possible, be an active participant in them. This raises your profile to get it noticed by other industry contacts and you’re also adding value to LinkedIn, which in turn, adds value to your own profile. Just remember, if you’re going to participate in group discussions, groups are about COMMUNITY not YOU. You should participate by all means, but to support the community not sell yourself or your services. Did you know? If you’re a member of the same group as another user, you can bypass the need to be a first degree connection in order to message them. In addition, group members are also able to view the profiles of other members of the same group without being connected. Join more groups to enable more messaging and profile viewership capabilities. You can join up to 50 groups. 11. Build Your Network. Once your profile is in good shape, work on building your network. Here are some things to keep in mind: when asking to connect with someone, use “we’ve done business together” rather than “friend.” Be sure to personalize any requests to connect with how you know the person or where you met or who you have in common. If you do decide to try to connect with someone that may not know you well, be absolutely sure that you defend your network invite in the personal note section, such as saying you just purchased their book or saw them speak at a major conference. If you invite people to your network and they mark your invitation as someone they do not know, you will be banned (temporarily) from inviting new people to your network unless you know their email address. 12. 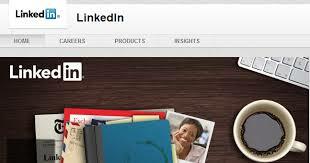 Use Linkedin As A CRM Tool. I know this really doesn’t fit into building your personal brand, but I thought this hint would be helpful as you’re building your network. You should know that Linkedin has a feature that allows you to segment your connections. 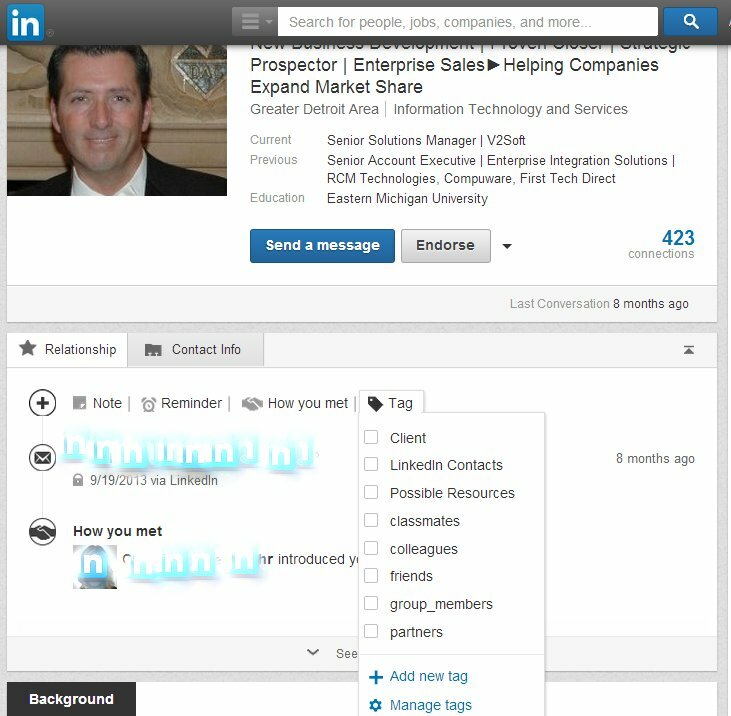 Once you’ve made the connection, make sure you “tag” them into certain folders turning Linkedin into a very powerful CRM tool that allows you to target messages to individuals or groups of people. There isn’t an easy way to go back and tag your contacts except one by one, so I highly recommend doing this as you add more connections. 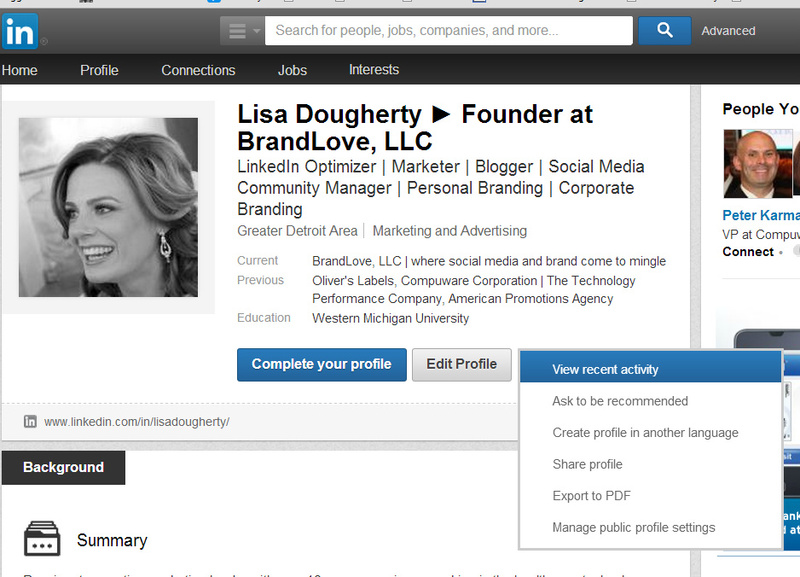 Move your cursor over Profile at the top of your homepage and select Edit Profile. I highly recommend using Internet Explorer. I am not able to do this using the Chrome browser. Scroll down to the section you want to add a sample and move your cursor over the add media icon (looks like a square with a plus sign). Click Save. An update will appear on the homepages of your network, letting others know you added the media file or link unless you have this feature turned off. 14. Jazz Up Your Profile With Symbols and Bullets. Using bullets, symbols and visual cues in your LinkedIn profile will definitely help to make yours stand out from the crowd in a positive way especially if you use them conservatively. Click here for a ‘How To.’ Like anything else, just make sure you don’t get too crazy or too cute with your choices in symbols. And, most importantly, make sure you don’t overuse them. You don’t want your profile to appear unprofessional. This will cheapen your personal brand which you’ve worked so hard to fine tune. I would love to hear if these tips worked for you, questions you may have and any Linkedin related success stories. Please share your thoughts in the comments below. If you found this article helpful, be sure to follow @BrandLove on Twitter, “Like” BrandLove on Facebook, follow BrandLove on LinkedIn and add BrandLove to your Google+ circles. There are many more tips and tricks on my other social networking sites. Thank you for reading this post and feel free to share it with your friends. Your support is much appreciated! 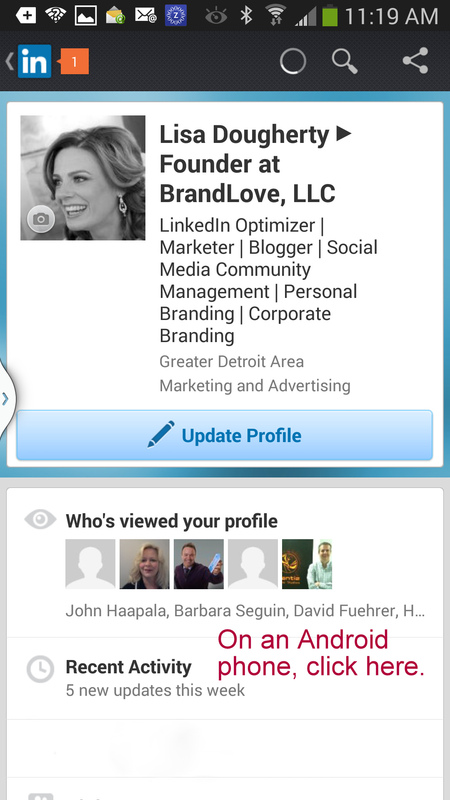 What better time than now to update your LinkedIn profile to make it stand out among the other 277 million users? 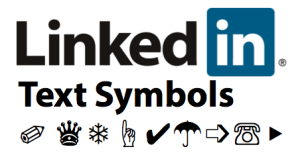 Using bullets, symbols and visual cues in your LinkedIn profile will definitely help to make yours stand out from the crowd in a positive way especially if you use them conservatively. My suggestion to you would be to use arrows, stars or vertical lines in your headline and title sections, bullets or ticks and horizontal lines in your summary section and diamonds, arrows or check marks in your ‘experience’ section. Like anything else, just make sure you don’t get too crazy or too cute with your choices in symbols. And, most importantly, make sure you don’t overuse them. You don’t want your profile to appear unprofessional. This will cheapen your personal brand which you’ve worked so hard to fine tune. 1. Find the symbol you want and drag your mouse over the character. 2. Press Ctrl + C to copy the symbol. 4. Ctrl + V to paste it into your profile. If you use a Mac, you can click Apple+V. 5. Save the changes to your profile and view your results. Make sure you copy and paste the lines several times! 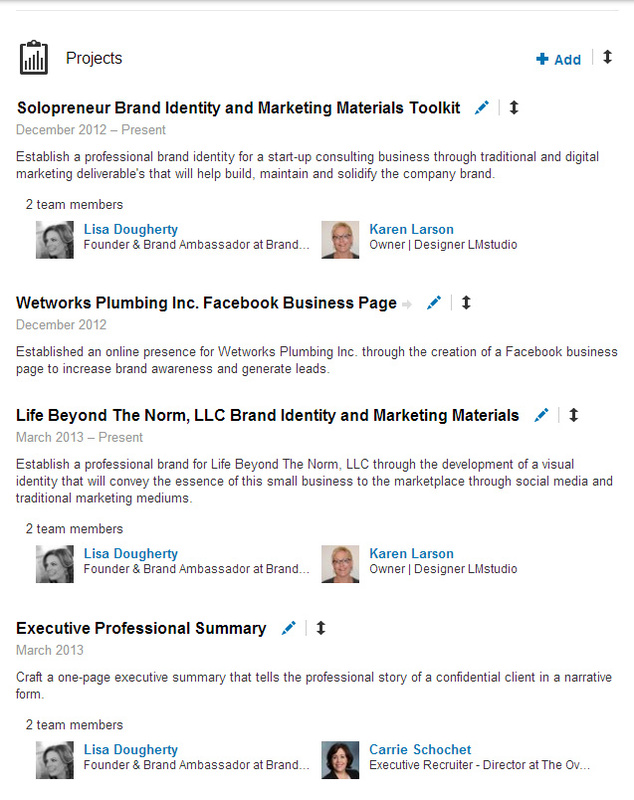 If you’re like me and wondering what happened to your status updates that you used to be able to see on any individual LinkedIn profile page, they’ve been eliminated as of December 2013! The activity feed showed on profiles showed your most recent activity. For example, recent connections, articles shared and so on. Why is this feature gone you ask? This is from LinkedIn, “we take a look at our features to evaluate how they’re being used by our members. Part of this process sometimes means we decide to eliminate a feature, so we can better invest those resources in building new and better LinkedIn products.” WHAT? I loved this feature! One of the main reasons I loved this feature is because I have 500+ connections, and it makes it virtually impossible to see updates from someone I follow regularly AND it will significantly impact my profile views. Also, I may need to research a person and want to check what types of content they are posting so I know what they are interested in for conversation starters. From a Recruiting perspective, this is valuable information to have displayed on profiles to glean information on potential candidates. From a job seekers perspective, I believe it is critical information to draw traffic to your profile page and to let Recruiters know a little more information about you if you’ve applied for a position. I certainly hope whatever new features they are working on, will solve this problem. LinkedIn says, “Being able to share what you do on LinkedIn is important to us and we are working on more useful ways for you and other members to view and interact with your activity on LinkedIn from your profile.” I hope they roll something out quickly. In the meantime, check out an interim solution. The good news is that you can still see “Recent Activity’ on your mobile phone if you have downloaded the LinkedIn app. If you haven’t, you can download it HERE for Android. And HERE, for the iPhone. They both are free downloads. 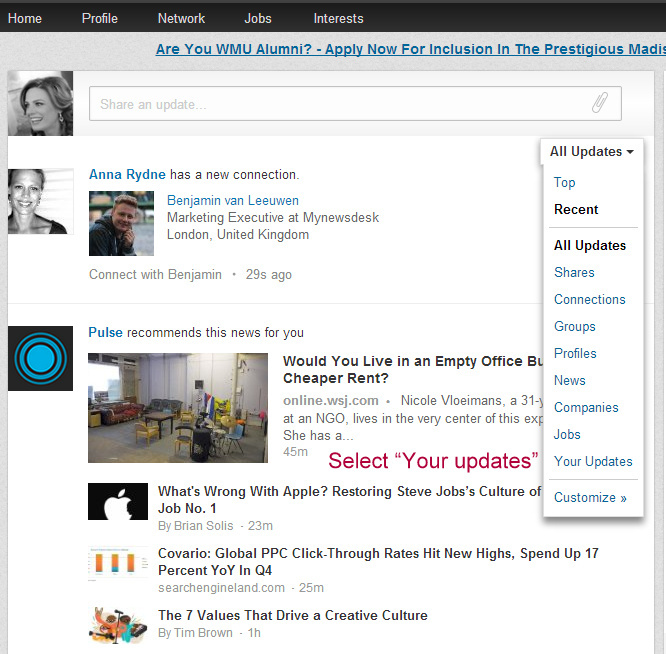 Click Home in the top left of your LinkedIn homepage. Move your cursor over All Updates, found below the Share box and to the right. You can also share updates to your network directly from the homepage, and you can have other activities broadcast to your network. A positive online presence is critical to any professional’s life, whether you’re a job seeker or secure in your current position. Professional networking sites like LinkedIn offer something that may not be fully available on other platforms: the ability to show off your work history, accomplishments and even your personality. Sure, you can always list the jobs you’ve had or where you went to school on other networks, however, LinkedIn provides an avenue for all professionals that just doesn’t compare to other sites. 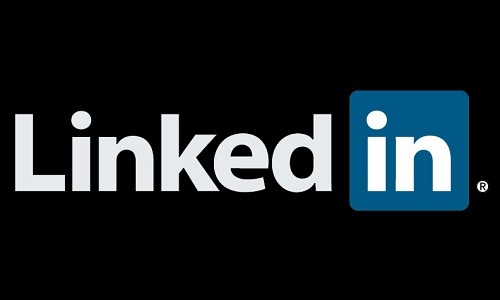 LinkedIn currently has more than 238 million members worldwide in over 200 countries, executives from all 2013 Fortune 500 companies as members and its corporate talent solutions are used by 90 of the Fortune 100 companies. It is the social network to be on if you want visibility and a channel for extreme networking capabilities. 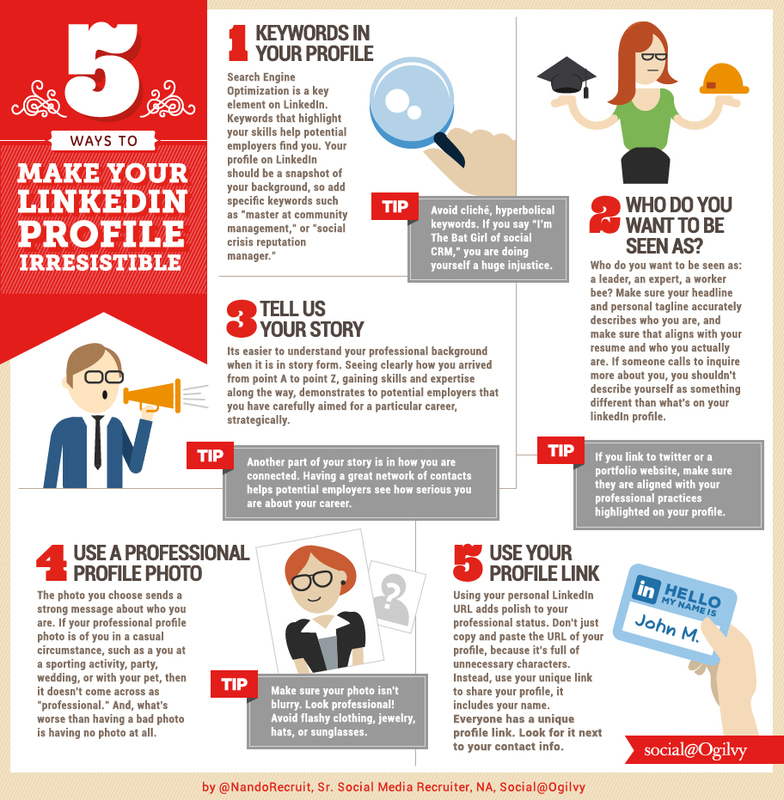 With that said, if you want to make the most of your LinkedIn profile, here are a few suggestions taken from the infographic created by Nando Rodriguez, Social@Ogilvy. Keywords in your profile – if recruiters can’t find you, they won’t hire you! If a recruiter is looking to fill a sales position and you are an expert networker, revenue-driving sales leader and you don’t highlight that in your profile, you aren’t showing up in search results. Those keywords should be organically scattered throughout your profile. Creativity is good when changing the template headline but don’t get too creative with wording. Trust me, no one will be searching for Marketing Guru or Sales Ninja. Who do you want to be seen as? People will sum up your personal brand in seconds. Make sure yours clearly defines who you are and is reflected on your profile and on your resume. Your resume should not tell a different story than your LinkedIn profile. Tell us your story – story telling is story selling as we all know. This tells potential employers that you strategically aimed for a particular career. Use A Professional Profile Photo. Let’s face it. People will judge you by your photo. In case you’re not sure what I’m talking about, here’s some suggestions of what not to do. No selfies. No photobombs. No family shots. No alcohol. No group shots. Keep your clothes on. Yes, I’ve seen a half-naked person. I’m not kidding. Don’t wear anything you wouldn’t wear to work. You get the idea. Rather, have a professional take your photo. Uncross your arms. Smile. Look friendly. Stand in front of a colored wall, or Photoshop one in, so your profile will stand out amongst the rest. Ask your photographer to give you a couple that are edited so you can update your profile every once in a while. It’s a good thing to keep your profile fresh. Customize Your LinkedIn URL. This will take you seconds to optimize and will look great in your email signature. Also, use this on your resume. If you’re unsure how to do this, check out an earlier blog post titled 11 Tips To Build Your Personal Brand on Linkedin for help and additional ways to improve your profile. If you found this article helpful, be sure to follow @BrandLoveLLC on Twitter, “Like” BrandLove on Facebook, follow BrandLove on LinkedIn and add BrandLove to your Google+ circles. There are many more tips and tricks on my other social networking sites. Thank you for reading this post and feel free to share it with your friends. Your support is much appreciated!